The famous company Fendi, offering the world a fairly wide range of different models, announces the release of a new collection of male models equipped with automatic mechanisms. 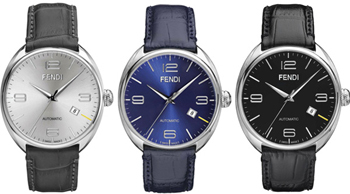 Fendimatica Automatic Collection presents a model in several color versions. The diameter is 42 mm shells, fabricated stainless steel. Multi-colored dials are equipped with large Arabic numerals “12”, “3”, “6” and “9”. Under the number “12” logo mark is placed. One need only look at once the dials to see an interesting item in time labels “four.” We are talking about the yellow line is where is the aperture of the date. In the central part of the dial has hour, minute and second hands. New items are available in three color versions: black, silver, blue. Protects dials models sapphire glass. The back of the models are also covered with sapphire windows that allow to enjoy the work of Swiss movements ETA 2824-2, decorated letters FFFF. Water Resistant – 50 meters. Delivered new to the leather straps of the same color, which made dials. Each model has its own serial number.